In February every year we are surrounded by the images and sounds of romantic love, from heart-shaped balloons in the checkout aisle to boxes of chocolate; there’s no escaping the madness. But let’s not forget that love is about more than just schmaltzy songs and cards that will probably be in the trash tomorrow. The love and affection that we create within our families, and show to our children, lasts longer than any material thing and has a long-term impact on adult lives. It is easy to see that children who grow up in a loving environment are comfortable in their own skins. But this ease and confidence goes beyond just day to day socialising. 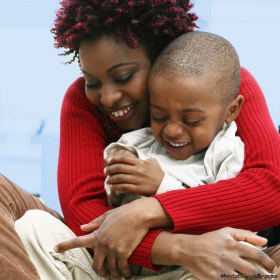 Numerous studies have proven that being shown love and affection in early childhood can have a positive impact on emotional well-being, general health and brain development in children. We also know that cuddling releases oxytocin, a hormone that improves happiness and a sense of connection to others. Children with higher oxytocin levels are more trusting and communicate easily, and have a higher functioning immune system, which means better overall health. So perhaps the most important thing we can do for our children might not be extra lessons or more toys, but a simple hug and a cuddle. Spend quality time with each child or family member individually. In a large family, it can be difficult to pay attention to every little detail, and children may feel that they have to compete for parental affection. Drink a cup of tea together, or take a quiet walk and chat about the day. We’re living in a high-tech world, so why not make that work for you? Send a quick text to older children, reminding them of how much they mean to you. A note in their lunchbox will get the little ones through the school day. Show affection to other members of the family – what children see is what they do. Show love, acceptance and affection, and they will grow up imitating a great role model. Hug your kids whenever you can – it’s always a good idea. We would love to learn about the various way in which families show their love, respect and affection for one another. So whether you all sit down for dinner regularly, or read together at bedtime, tweet us a pic, tell us how things work in your home, and let’s all share the love this month. This entry was posted in Parenting, Xander Blog and tagged affection, kids, love, Parenting.